A cold snap gripping western Canada may be just brutal enough to put a dent in Alberta’s destructive mountain pine beetle. A cold snap gripping western Canada may be just brutal enough to put a dent in Alberta's destructive mountain pine beetle. While most Albertans despair the cold, those on the front lines of the fight against the mountain pine beetle are quietly rejoicing, said Janice Cooke, an associate professor in the University of Alberta's department of biological sciences. Untold numbers of young beetles are freezing to death, Cooke said. "The colder we go, the more we kill," Cooke said in an interview Monday with CBC Radio's Edmonton AM. "We've been very fortunate this year; the cold snap that we've had has been particularly vicious where the outbreak is of most concern and that's not only in Jasper National Park, but beyond the park gates towards Hinton." The tiny beetle survives by burrowing under the bark of pine trees and mining the phloem, the layer between the bark and wood of the tree. After the beetle eggs hatch, the grub-like larvae spend the winter feeding under the bark before they mature in spring and fly off in search of new trees. Trees can die within weeks of an attack, turning red after succumbing to the beetles' onslaught. Infestations have brought down more than 16 million hectares of B.C. forest, and have begun destroying huge swaths of Alberta's boreal habitat. 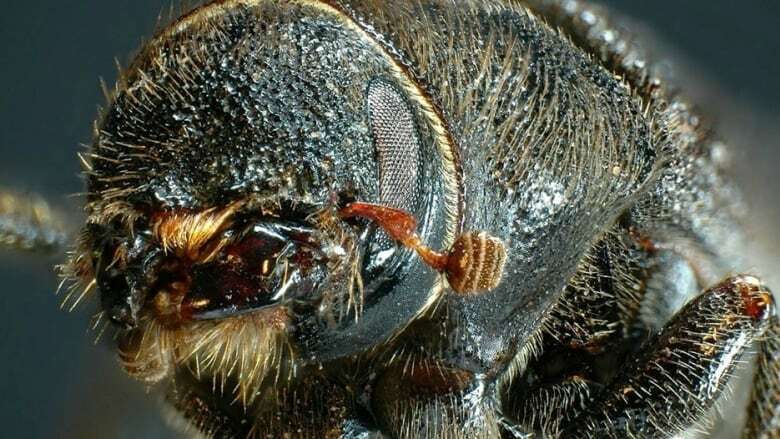 Much like the infamously hard-to-kill cockroach, the mountain pine beetle produces a sort of antifreeze in its blood, allowing it to withstand the cold. However, extended periods of extreme temperatures can kill mountain pine beetles if it happens for long enough at the right time. Cooke estimates that the recent cold weather has killed off 90 per cent of pine beetle larvae infestations in some areas of the province. "Right now, the beetles are actually larvae or baby beetles at their maximum cold hardiness, and so we have to get colder now than we would in December to kill beetles," she said. "We can't just say that –40 C for a week will kill them all. That turned out to be a bit of a myth. "Unfortunately, there is no magic number for temperature," Cooke said. "It's more like a dimmer switch. The colder it gets the more beetles are going to reach their limit of tolerance." The Alberta government has spent hundreds of millions of dollars to stop the pest's spread. This involves regular aerial surveys and clear-cutting of infected trees. A lack of extended cold weather in recent years has allowed the beetle populations to expand at alarming rates, Cooke said. The decimation of populations from the recent cold will buy invaluable time for those working to control the invasive population, Cooke said. "There are going to be fewer beetles spreading out as they mature and fly this summer so fewer trees will get attacked," she said. "But we'll never kill them all with cold." The full extent of the winter kill-off will not be known until the insects mature and emerge this summer, but researchers will carefully examine the population through aerial surveying, Cooke said. Any changes in the spread of juveniles will help inform management practices through the coming year.